Puglia Italy, a region in the southeast corner, is a place it seems many have not yet discovered. Earlier this year a friend of mine from Positano suggested that I visit, and after a quick google search I immediately added it to my annual July Europe trip itinerary. 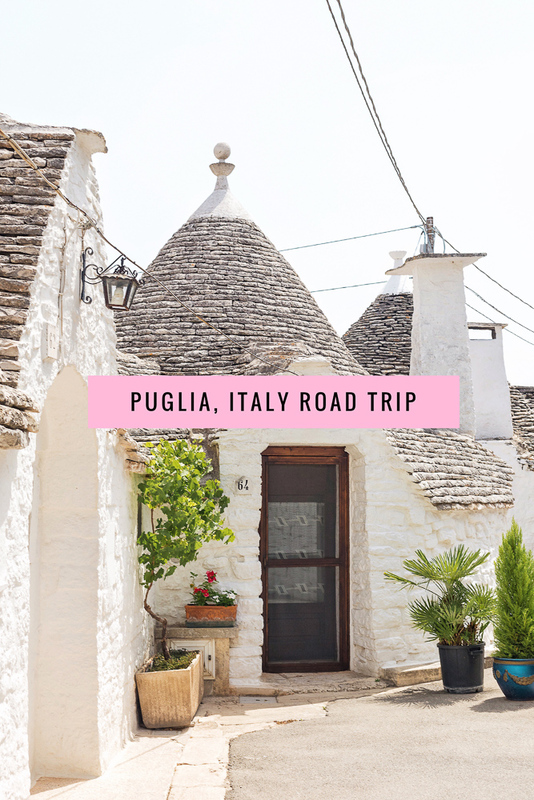 Before arriving in Puglia, I came up with a list of towns I wanted to visit based on a combination of my Positano friend’s suggestions, places I saw in photos on Instagram, and recommendations from Puglia local Manuela who I follow on Instagram. From there I narrowed the list down to a final itinerary of 10 towns, 8 of which we actually made it to, based on the amount of time we were planning to spend in the region. We spent a total of about three days in Puglia, but if you have more time you could easily extend it further. Manuela, in fact, recommends at least ten days. To get to Puglia, we flew into Bari, the capital of Puglia. From there we rented a car from Avis at the airport which was surprisingly just as easy as it is in the US. I always rent from Avis because I have status with them but the people at this location were great so I would honestly recommend doing the same. Do you have to rent a car? Yes. There are some trains and buses but they are not nearly as efficient and will be way more time consuming. If the idea of driving in Italy is scary to you, you are not alone. I was in the same boat but after reading countless blogposts about it being really the only way to do it, we gave in and agreed to rent a car. To my surprise it was no big deal for the most part, the only real trouble being driving on extremely narrow roads once actually in the towns and parallel parking in very small spots. My $.02: get the smallest car you can. Before we get into the itinerary, let’s talk about planning tools! As a full time traveler with a LOT of experience planning trips, I have a handful of sites and tools that I cannot live without. They save me money, time, and frustration - all of which are very important for me and should be to you, too. COMFORTABLE SHOES. You will likely (hopefully) be doing a lot of walking so this is very important! My very favorite are M. Gemi’s white leather sneakers. I literally never travel anywhere without them. Click here to see latest prices! More details: click here for why they're the most comfortable and stylish walking shoes for travel. SUNDRESSES. If there is one thing that screams Italy to me, it is sundresses! Click here for my favorite sundresses for Italy. I also shop for them here, here, and here. BLACK PASHMINA. A total lifesaver! It folds up small so you are able to easily throw it in any bag and it weighs basically nothing. However, because of the material it is capable of keeping you surprisingly warm in situations where you have mistakenly underestimated the weather. You can wear it as a scarf, wrap it around your body like a shawl, use it as a blanket on cold planes or trains, etc. - it serves so many purposes. I recommend a black one because black goes with everything and if it gets dirty along the way it will be way less noticeable. Pro tip: if you’re only bringing a small cross body bag with room for your wallet, tie it to the strap! Click here for J. Crew’s best selling version. For a full packing list, click here for what to pack for Italy! There are so many lovely places to stay that I dedicated an entire post to it! Click here for where to stay in Puglia. Polignano a Mare is a beautiful town south of Bari by about 45 minutes. I decided to make it our home base after finding a great Airbnb right in town and seeing how many different things there were to see and do in town. I would absolutely recommend you do the same. There are many great restaurants you can go to for breakfast before heading out and/or for dinner once you return from your day trips and it is a bit more lively than a lot of the other smaller towns. We stayed in this Airbnb and loved it. It’s in a great location, the apartment is beautiful and spacious, the price is very reasonable, and Nico and Giuseppe were wonderful hosts. There’s even a hot tub on the roof! Plus you can get $40 off your first Airbnb booking here. Start your first day in the city of Lecce, a little over an hour south of Polignano. Lecce is a historic city and one of the most popular destinations in southern Italy. 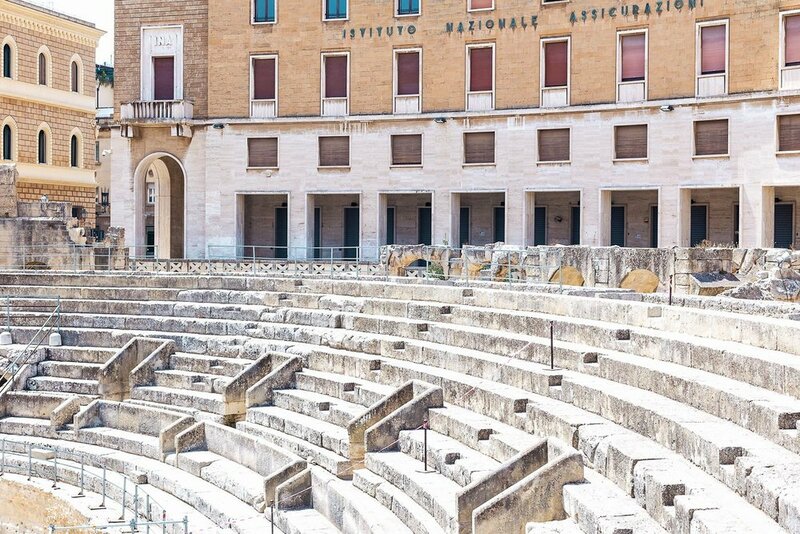 It’s known for it’s baroque buildings and even has it’s own Roman amphitheater, the dating of which is still unknown. It is often called "the Florence of the South" as well. 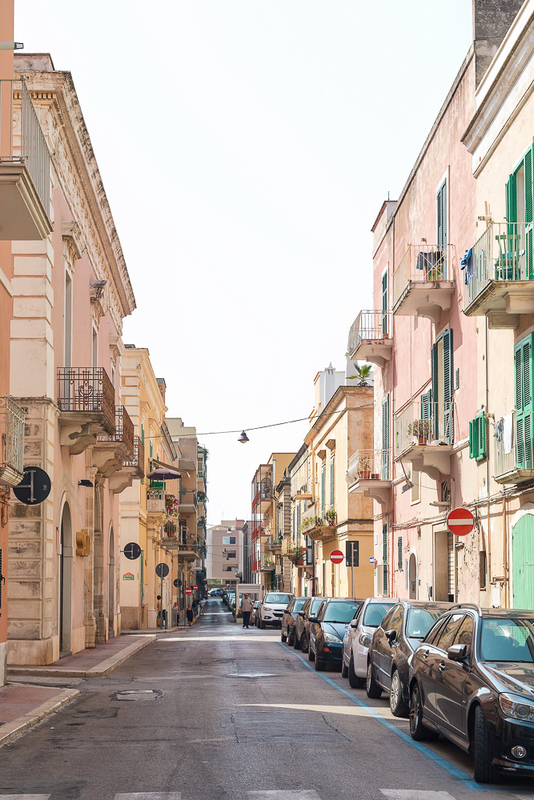 Gallipoli, which translates to “beautiful city”, is just over half an hour south of Lecce. If you look at it on a map you will notice it splits into two parts: a mainland on the right and a small island accessible by bridge on the left. Skip the mainland and head straight to the island - that’s the old town where you’ll find the beautiful beaches you see in all of the photos and narrow, colorful streets perfect for getting lost in. Start day two of your Puglia adventure with a quick 35 minute drive from your Polignano home base to the town of Alberobello. Alberobello was easily the highlight of Puglia for me, so much so that we actually went twice! It’s famous for it’s unique trullo buildings (whitened dry-stone huts with pointed stone roofs) and is now a UNESCO World Heritage site. Unfortunately it seems that the Alberobello secret is out, so try to get here as early as possible to avoid the huge crowds and full parking lots. The second time we went we arrived around 8am and found it to be pleasantly deserted at that time :) We did not eat here but there are a ton of ton of cute cafes and restaurants on the main street so it might be a good idea to plan for lunch here! Note: we went in July during prime tourist season so it might have been unusually busy during our trip. WHERE TO STAY IN ALBEROBELLO: Palazzo Scotto. Learn more at Where to Stay in Puglia Italy. Once you are done at Alberobello, head to Monopoli, a colorful town located right on the Adriatic Sea. It's name, stemming from "monos polis", means unique city. 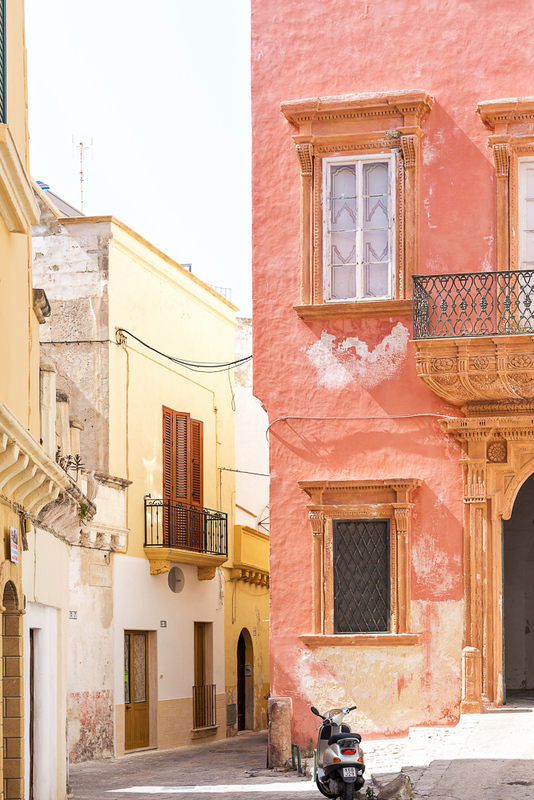 While we spent all of our time roaming the colorful streets near the city center, a quick google search suggests that the most beautiful Monopoli is the one you see from the water so do not miss that like we did! WHERE TO STAY IN MONOPOLI: Don Ferrante, Il Melograno, or La Peschiera. Learn more at Where to Stay in Puglia Italy. 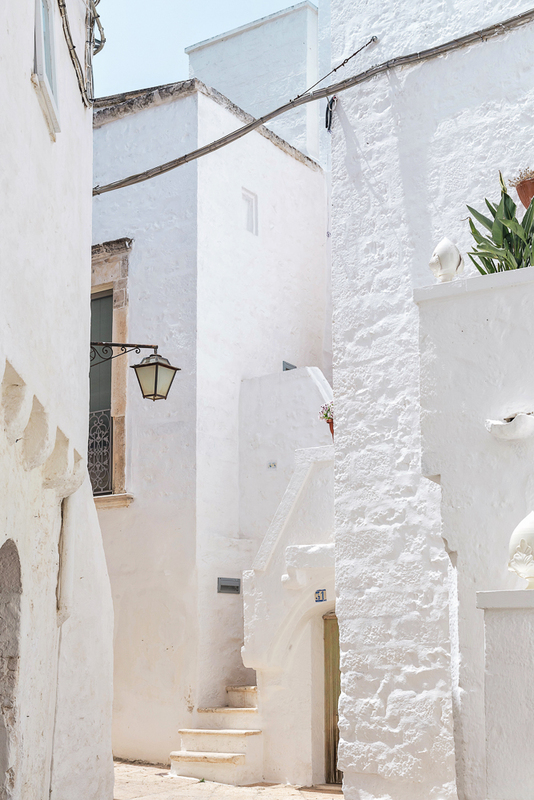 Locorotondo, a beautiful whitewashed town covered in cobblestone streets, is again just a quick 35 minute drive from your Polignano home base. We spent our time here with no agenda, simply strolling through the streets snapping photos at anything we found to be aesthetically pleasing. Even in the middle of peak tourist season we found it to be extremely empty which is of course a big plus if you plan to visit for photography purposes. If you find yourself in Locorotondo around lunch time, stop by Ristorante La Scalinata. The people there were some of the sweetest we met our entire trip! WHERE TO STAY IN LOCOROTONDO: Ottolire Resort. Learn more at Where to Stay in Puglia Italy. Cisternino is another beautiful whitewashed town (that's the theme of day 3!) and one I had not seen on any Puglia posts or even heard of until Manuela mentioned it. We did basically no research on it prior to arriving and lucked out in stumbling upon the most beautiful area full of all-white buildings - perfect for Instagram! Of the eight towns we visited this was without a doubt one of my favorites due to how photogenic it is and one that I would not pass up if I were you. 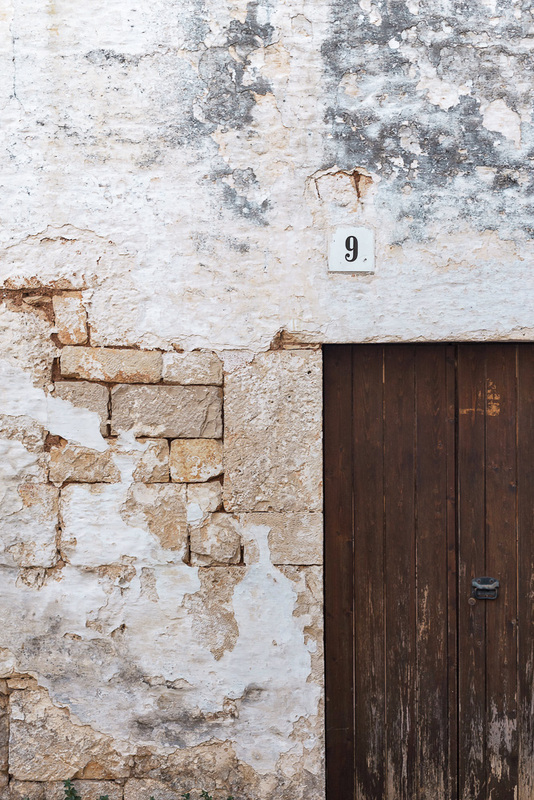 WHERE TO STAY IN CISTERNINO: Trullo Del 1800 in Valle D’Itria Airbnb. Learn more at Where to Stay in Puglia Italy. The famous white town, Ostuni, sits high on a hill (three hills, apparently) and is one of the most sought after Puglia destinations. It is a popular summer destination and despite it's reputation as the white city, I actually found it to be less white than Cisternino! You should definitely give yourself some time to simply roam the beautiful alleyways and streets here and do not miss the beautiful castle or the cathedral in the center. WHERE TO STAY IN OSTUNI: PIETRACHIARA CHARMING HOUSE ROOF TERRACE Airbnb. Learn more at Where to Stay in Puglia Italy. 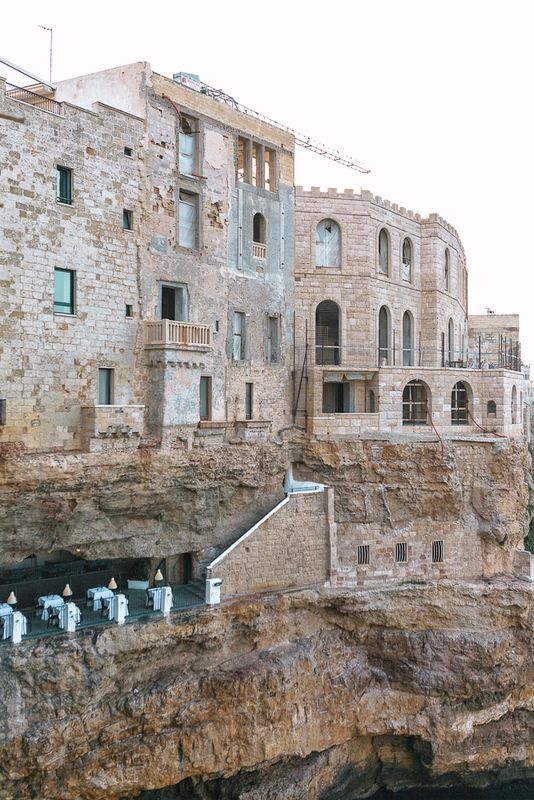 Is Dining at Grotta Palazzese Cave Restaurant Italy Worth It?